The second round of holiday cups will feature even more of the familiar red hue. Plus, why you might see Chance the Rapper or Lady Gaga on your gift card. While celebrating the twentieth year of Starbucks’ holiday cup tradition, some fans might have been surprised to see the launch of this season’s holiday cups included a less red-colored design than in the past. Of course, Starbucks holiday cups weren’t always red as this retrospective proves, but the term “red cups” has become synonymous with the seasonal vessels. That said, the first round of cups this year featured a white cup with a black and white sketch that customers were encouraged to color in with their own creative ideas. But being the twentieth year, why stop there? Starbucks just announced another cup design, and this one is heartwarmingly red. Part of the coffee chain’s #GiveGood campaign, the cups feature a white heart and two line-drawing hands using thumbs and forefingers to create the familiar heart shape overlaid on top. Other than that, the cups are as red as red can be (whether or not that will be placating to any fans who were part of the uproar in 2015 remains to be seen). The heart motif is meant to inspire customers to consider who they want to “give their heart to this season” and to write that person's name in the heart, a Starbucks representative tells Food & Wine. Yet another way Starbucks is giving back is highlighted by a favorite stocking stuffer for anyone who loves coffee. 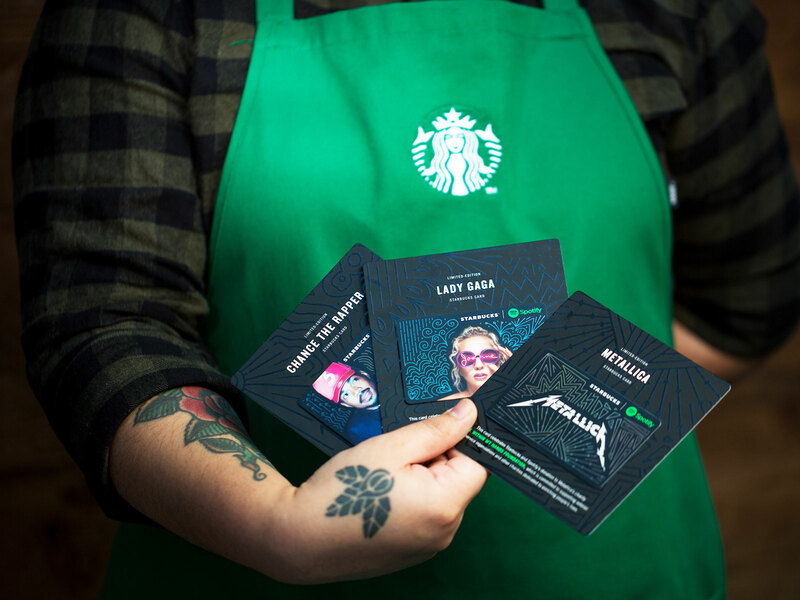 Starting today, customers will see Starbucks gift cards emblazoned with Chance the Rapper, Lady Gaga, and Metallica. Customers who load up $25 can snag a collectible card which commemorates Spotify and Starbucks' commitment to donate a total of $1 million to Chance’s Socialworks Chicago, Gaga’s Born This Way Foundation, and Metallica’s All Within My Hands foundation. Givers and receivers of the cards will also be eligible to sign up for a three-month Spotify premium trial for just 99 cents.